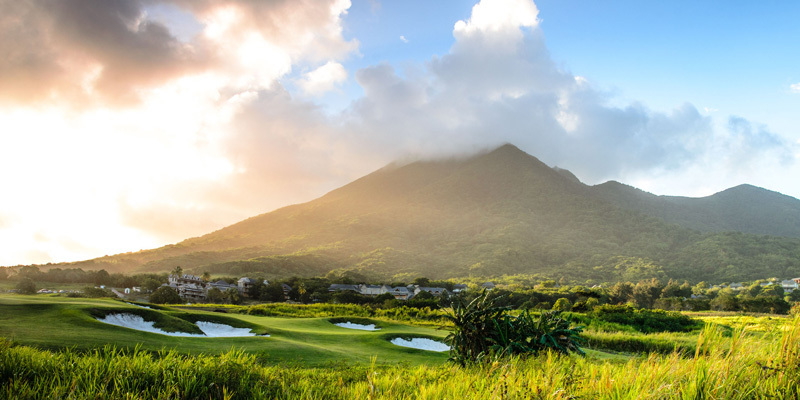 On the lush slopes of Mt Liamuga on north of the island of St Kitts sits Irie Fields, one of EGD’s newest Golf Courses. On first look it may not seem too dissimilar to many of our other projects but this pioneering destination is more than a little different. 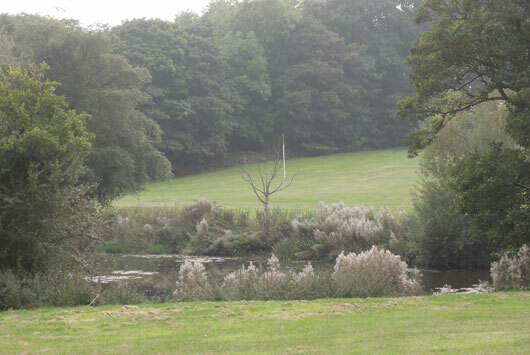 From the start the development team had the intention to create a world class golf resort but the overriding theme has always been to create a golf course that would be truly sustainable that, importantly, would provide a benefit to the local community. 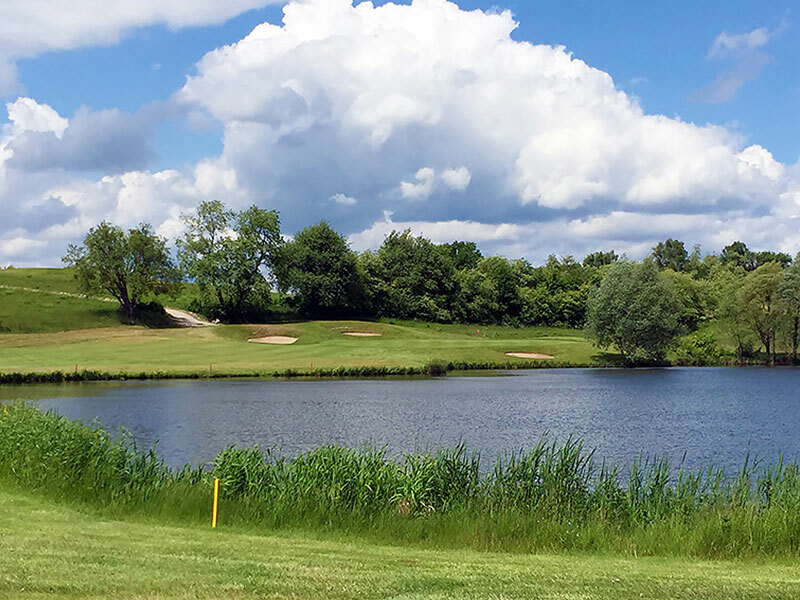 This thinking was not just limited to the design and construction of the golf course but also to the ongoing management and consequently Irie Fields is now one of the first completely organically managed warm season golf courses anywhere. The result of all this hard work is that Irie Fields has just become the first in the World to attain GEO Certified – Development Status helping to set new standards for golf course development. 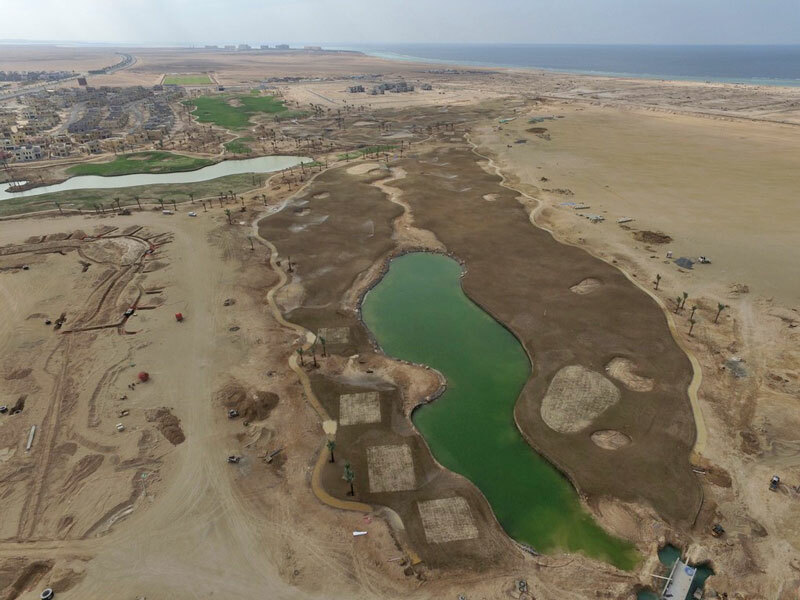 Construction work on the golf course was completed in 2015 and the course is set to open in mid-2016. 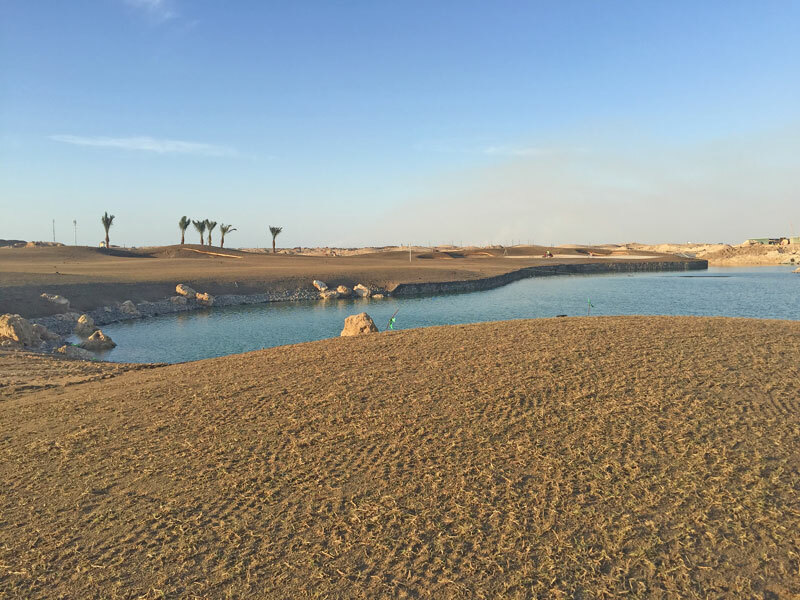 Last week’s site trip to Royal Greens Golf and Country Club in Saudi Arabia was a momentous one, with grassing approvals granted for Holes 1 & 9, the last holes to be concluded on the front nine. Much work is still to be done on these holes, but this milestone is definitely a great achievement. 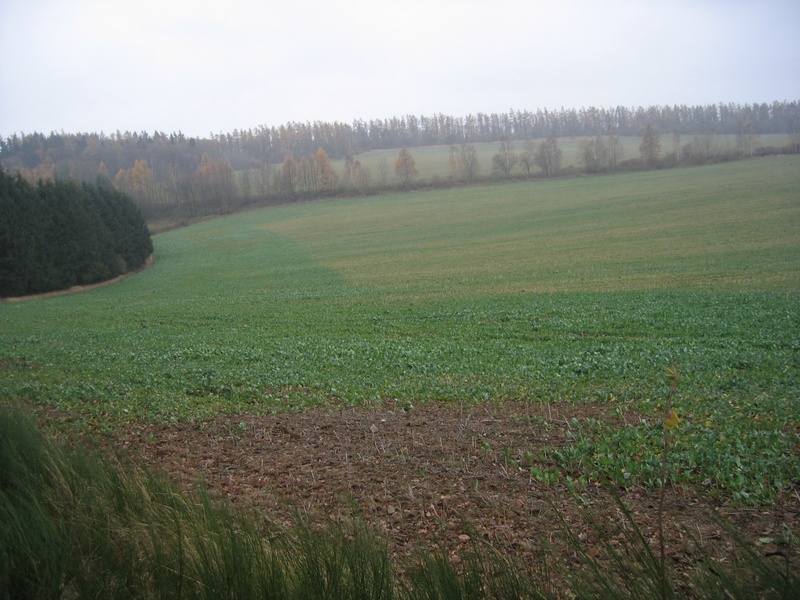 Landscape planting works shall commence early in the new year and this will really assist in transforming and defining the holes. 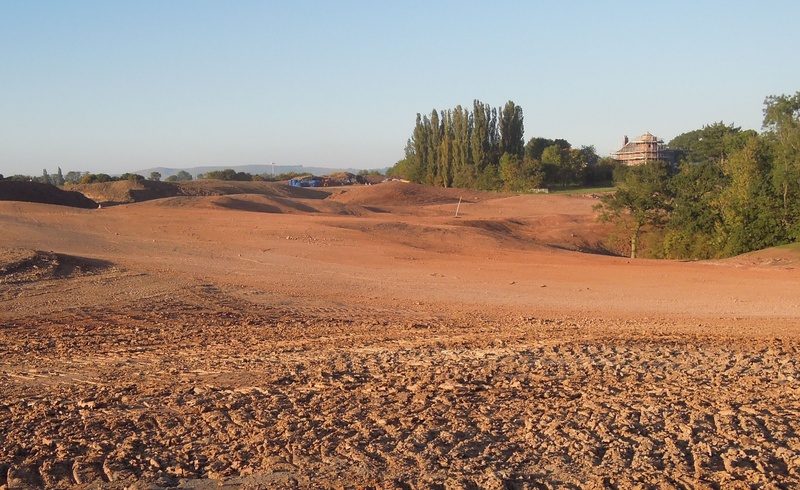 In terms of the course’s building facilities, construction works on the impressive Clubhouse are progressing apace, ground has now been broken on the Maintenance Facility, with the Academy building commencing next month. An exciting 2016 lies in store. Hole 9 from the 1st fairway. Aerial view of Hole 1 and 9. 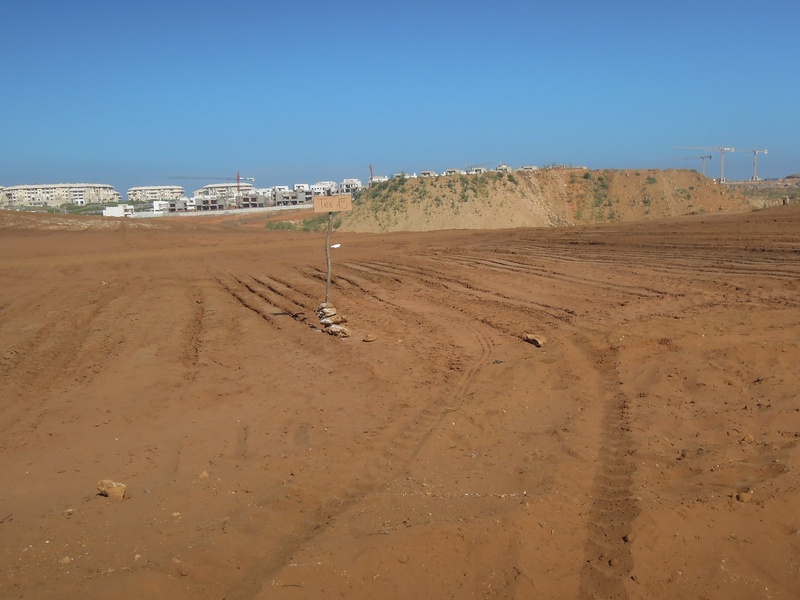 So, after a project commencement date sometime in late 2007, I am pleased & excited to say that on almost the 8th anniversary of our King Abdullah Economic City project in Saudi Arabia, I finally witnessed the first grass sprigs getting planted at the Royal Greens Golf Club. 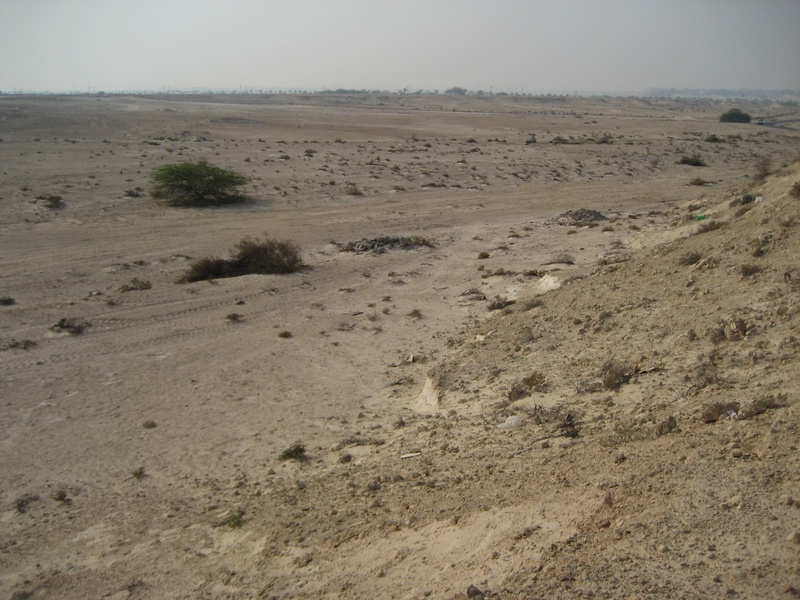 Back in 2009, following the shaping works of almost 16 holes, the recession hit, and works ground to halt. 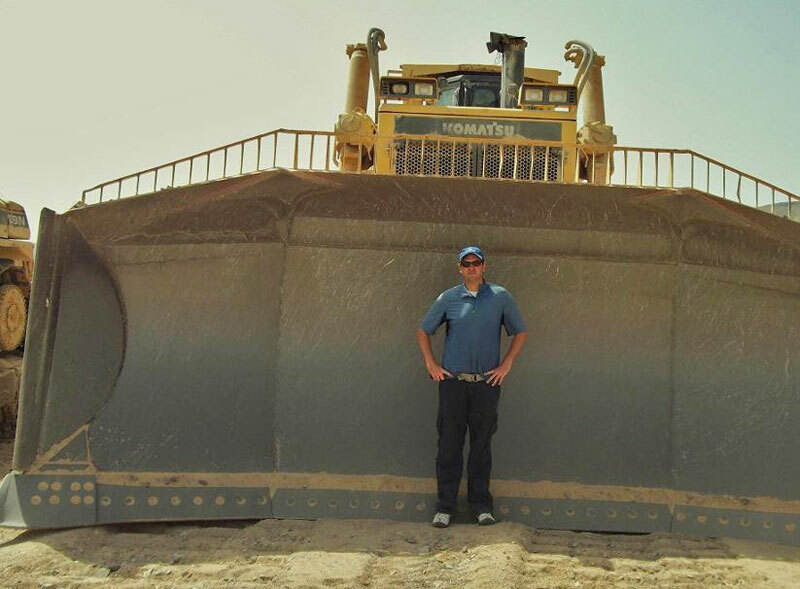 Six years on, and late last year, works re-commenced and the dozer machines were once again put to task. 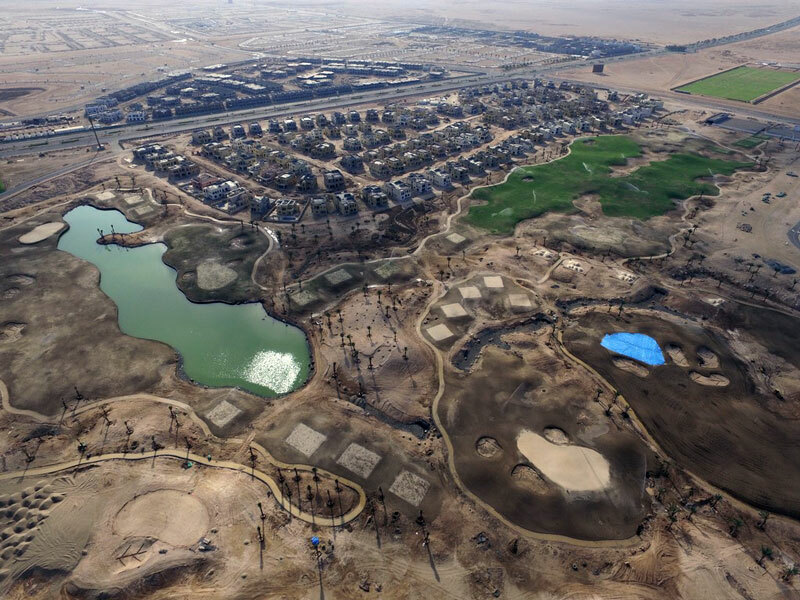 Aerial view of front nine holes at Royal Greens Golf & Country Club in Saudi Arabia during grassing. Last week Gary, Ross, Dave and myself attended the annual EIGCA conference and AGM at the Marine Hotel in North Berwick. It was a great trip that involved golf at North Berwick West Links and Gullane no. 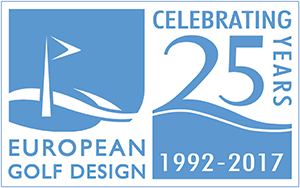 2, courses that attracted golf architects and industry specialists from all over the world. 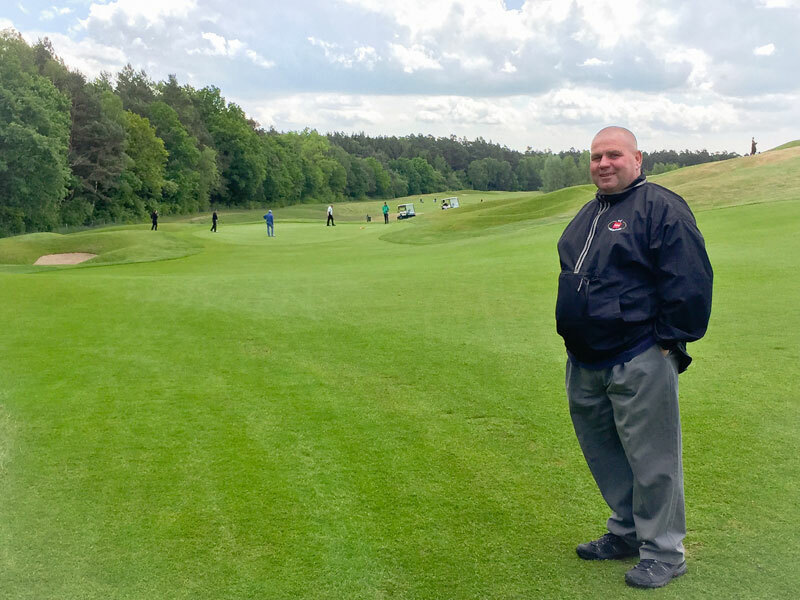 Along with golf and the AGM, a conference day featured guest speakers covering a wide range of topics including ‘Growing the Game’, Flat v’s Undulating Greens’ and ‘Rating GB&I’s Top 100 Courses’. For many reasons it’s probably best I don’t go into details about the golf, congratulations to Paul Kimber and Niall Glen though who picked up first and second prize in the President’s Cup respectively. The prizes were awarded at the President’s dinner which also saw Peter Fjällman hand over to Tom Mackenzie. 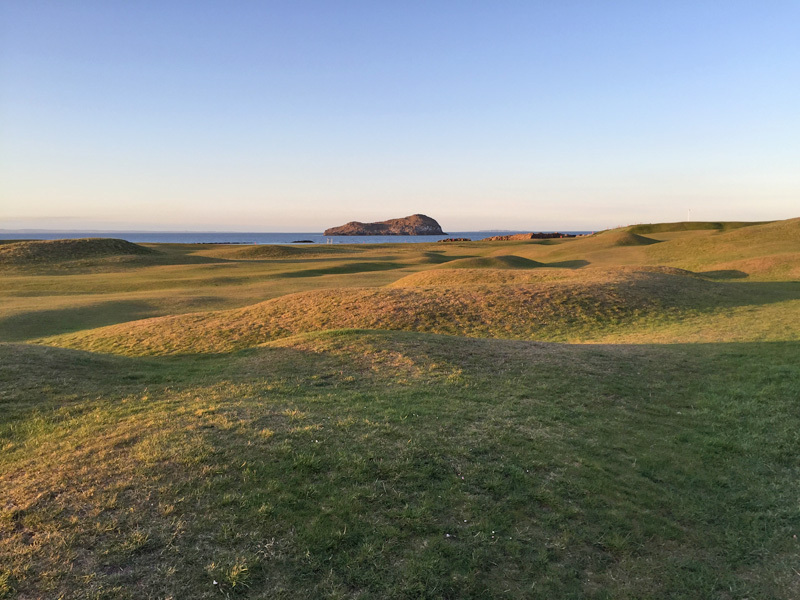 Thank you to all at the EIGCA for organising the event, their industry partners who make it all possible and North Berwick and Gullane Golf Club for making us most welcome. We are looking forward to next year already! 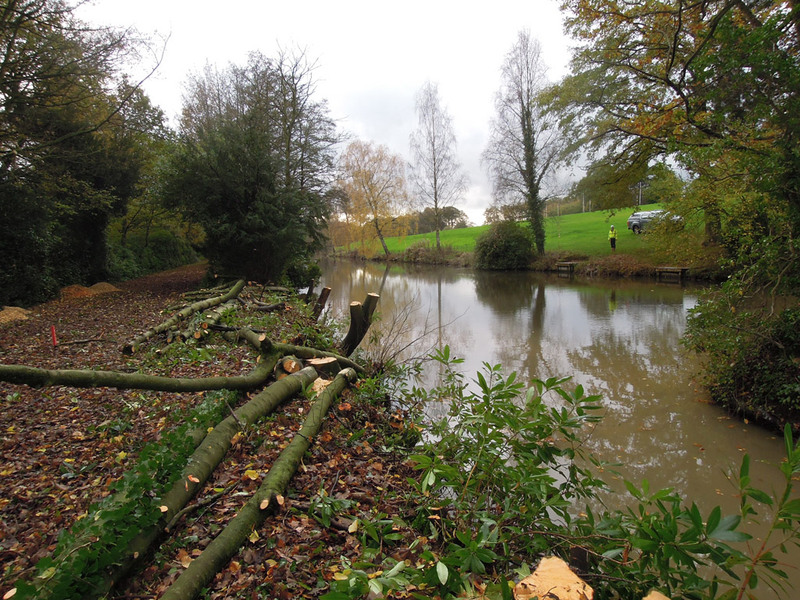 As the first earthworks phase comes to a close for the winter break, we are moving into the tree clearance programme. 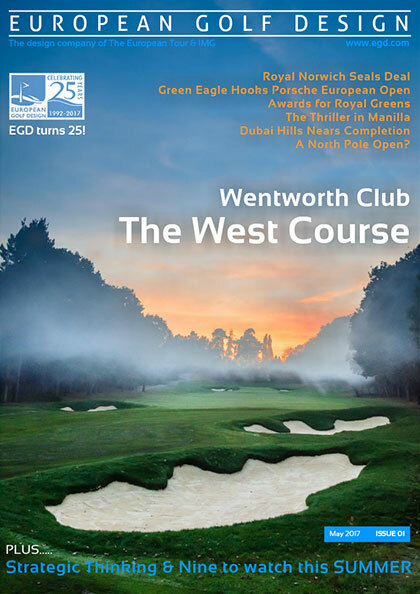 The first two areas completed have revealed the exciting prospects in store for the 1st and 17th holes of the Woodseat Hall Golf Course. We’ve cleared some of the bushes and trees for the Medal tee on Hole 1, which has revealed the challenging diagonal tee shot across Woodseat Lake. This is only the start of the story, for the lake is going to be substantially enlarged between the tee and the dogleg to make this view even more dramatic. 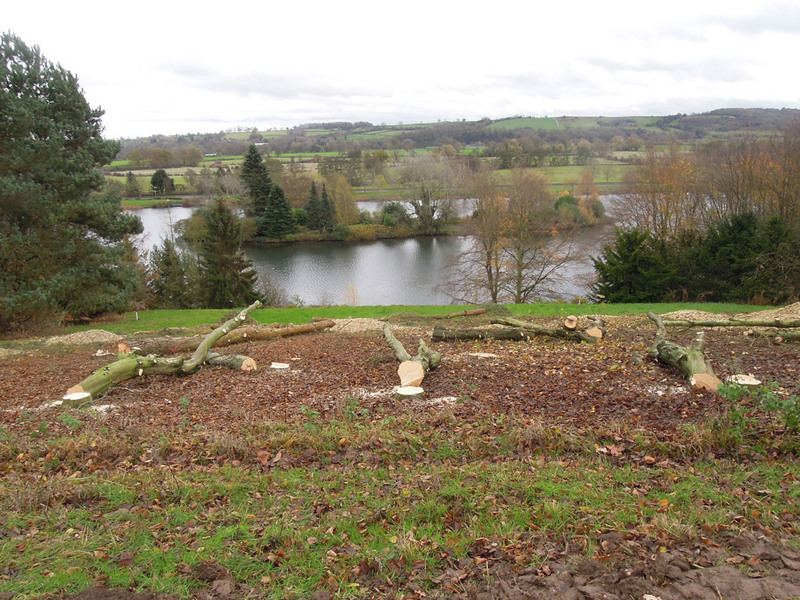 Elsewhere, we’ve cleared the trees away to display the full panorama for the tee shot on our already iconic 17th hole. I’ve been looking forward to finally seeing this view in its full glory and am entirely satisfied that we’re on the right track to create a hole to do justice to this wonderful setting. Below:From the 200-yard tee down to the island that will become the 17th green. Below:From the Medal tee on Hole 1. The 17th Hole is the first of two of the finest consecutive finishing holes you will find anywhere in the world. The favourable weather conditions during September have helped the JCB Woodseat Hall construction project get off to a good start. The tender for the bulk muck shift contract was competed for during July, and the appropriately named JC Balls & Sons, out of Ambergate, in Derbyshire, were the successful bidders. 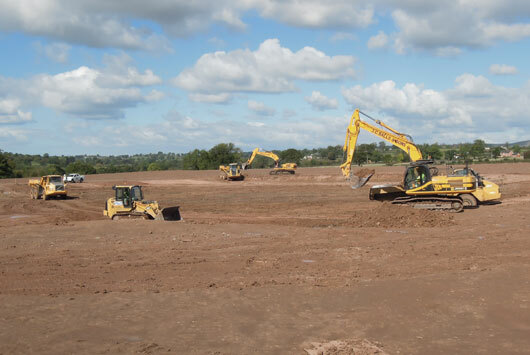 Their main task is to strip and store the topsoil and to shape the subsoil in six of the eleven work sectors that the golf course site is divided into. Balls has also staked out the golf course with enormous staking poles (4 metres high) and will be tackling some of the tree and hedgerow clearance. The first new hole has emerged from the ground in its roughed out state (the par 3 14th) and is looking good. 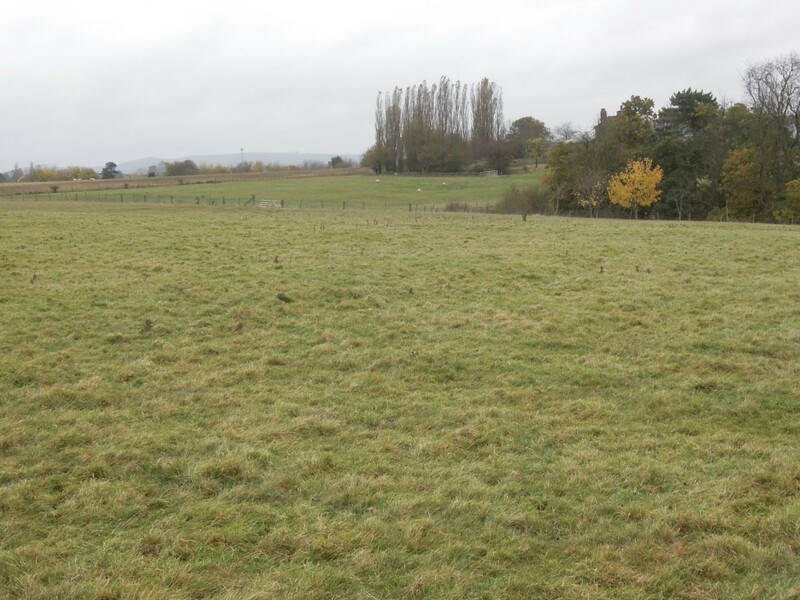 We’ve started on the least promising part of the site, upon which the most dramatic shaping is proposed. The large excavation of the irrigation lake on 13 is generating the subsoil which will shape this hole, the 14th and the practice ground. It’ll be a while until we see how this shapes out. Nearly one-third of the entire earth moving balance is being generated by this one hole alone. Work will break off for the winter months if the anticipated rainfall arrives, before we hit it hard in the springtime. Hopefully, by this time next year, the fully shaped golf course will be with us. 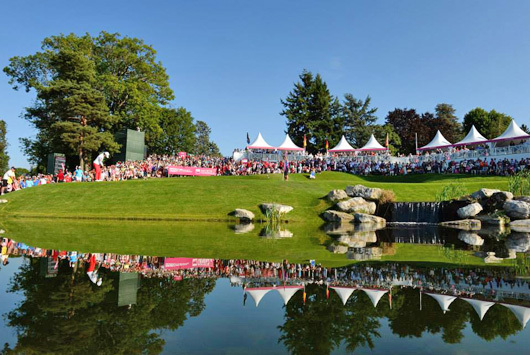 I returned to Evian for the first time since the inaugural Evian Championship in September 2013 (formerly the Evian Masters), and was glad to see how much the course had improved over the past year. 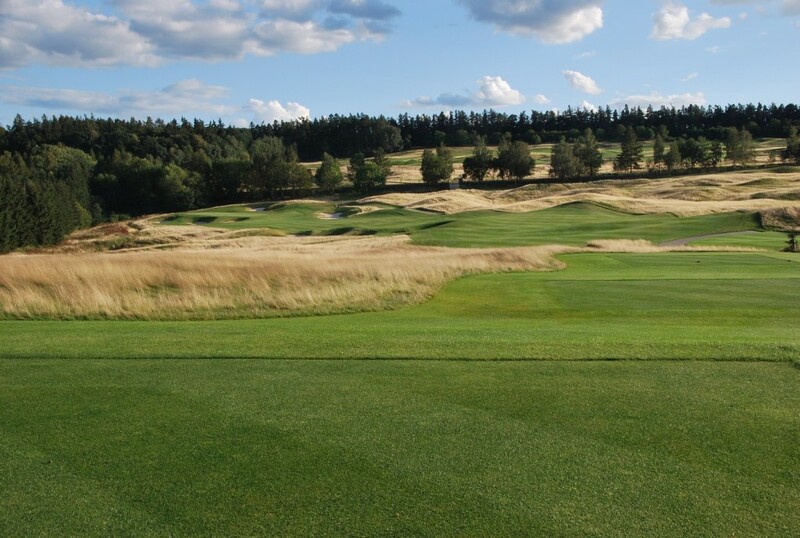 Conditions during both construction and last year’s tournament were unseasonably extreme, with excessive snow being encountered through the winter build, and torrential rain during the tournament causing the championship to be reduced to 54 holes. A year on, and the course has come on significantly. After the previous year’s travails, drainage improvements have been carried out in-house over the past year, and these have further assisted with the overall improved turf quality, course setup and presentation throughout. 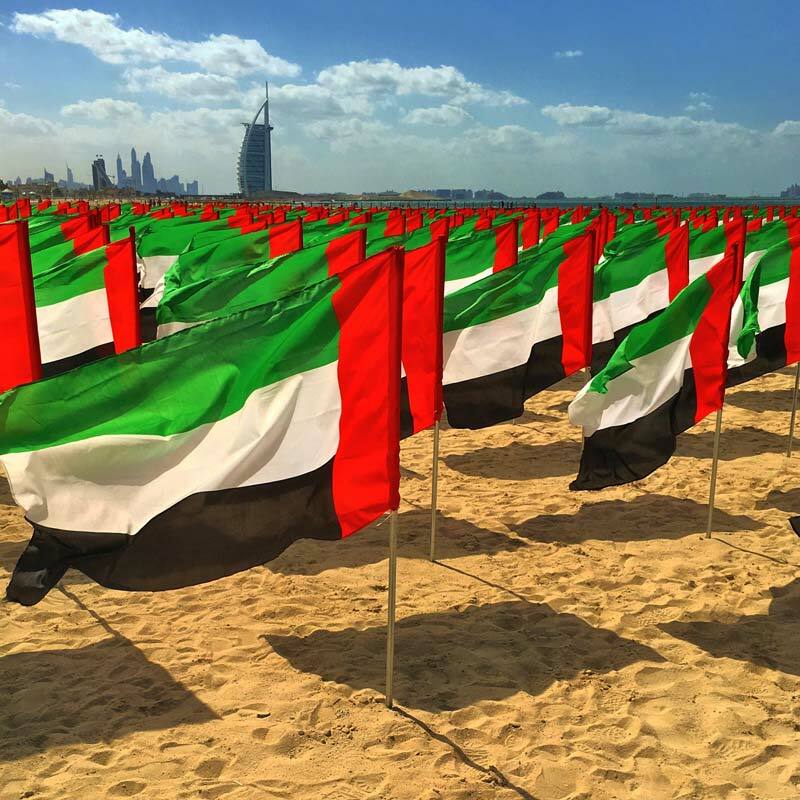 In terms of a ‘major’ tournament experience, the golf club have made great strides on this front. The purchasing of a narrow strip of land above the right side of the short par 3 16th has provided the event with improved spectator & hospitality platforms around the newly termed, Evian ‘Puzzle’ (Holes, 5, 15, 16 & 18) . Also improved is the seating amphitheatre behind 18 green which has been steepened slightly to improve viewing down over the green complex. The Golf Club is extremely proactive and forward thinking, with further additions and improvements planned for next year, most notably, a full length cart path system. On the course front, drainage improvements will be ongoing and minor amendments to a couple of greens may also be carried out. Finally, this year’s tournament, played in much more favourable sunny and firm conditions, was won by the 19 year old South Korean, Hjo Joo Kim. Her winning score of 273 (11 under par), amazingly contained a record low score for a major of 61 (10 under) on day one. Many congratulations to her and everyone else who made this year’s championship such a success. A few weeks back, seven friends and I made a golfing pilgrimage to the home of golf. For some in the group, this was their first experience of St Andrews and the main aim was securing two tee times in the Old Course ballot. For most, this annual golfing competition is one the highlights of the year. 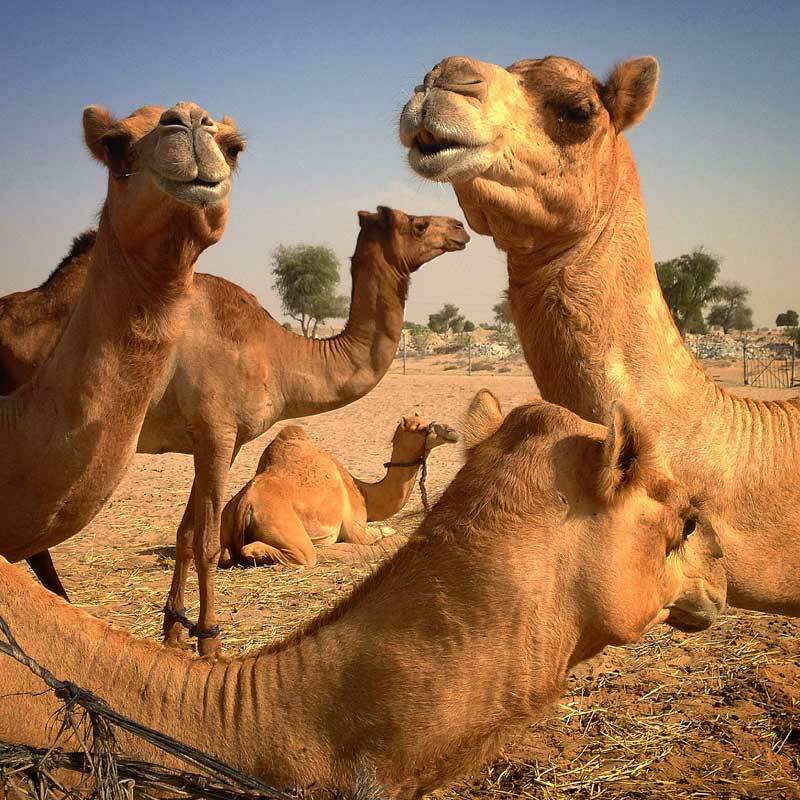 Four rounds of golf, three nights of party…..a pretty decent recipe for a good time! Onto the golf, the first round took place over the Balcomie Links at Crail. Once a squally shower passed through just minutes before our tee times, we were treated to a gloriously sunny afternoon. In general, the golf was pretty decent, and the course was in good condition. In terms of the holes themselves, there are some really good holes, most notably the par 4 5th, which wraps its way around a bay. Unfortunately, there are a few too many average holes, however, the setting is fantastic, which more than makes up. The day before the trip we found out that only one of the four balls had been successful in the Old Course ballot for the second days’ golf, with three of the successful four having played the course before. Unfortunately however, the ‘three’ were permitted from swapping places with the Old Course ‘virgins’. Nonetheless, the unfortunate four ball decided to queue up early the next morning and chance their arms (resulting in a relatively ‘quiet’ first night). Little did they know that they would be attempting on what turned out to be the course’s busiest day of the year! Arriving at 5:45am, they were 43-46 in the queue (no 1 arrived at 11:30pm the night before…so much was the demand!) At 7:30am, they threw in the towels and headed for a round on the New Course. With four of us on the Old and four on the New, we decided that day two could not count towards the ‘Cup’. Being one of the fortunate four on the Old, I was grateful for another opportunity to play and further examine / study / experience the Old Course. It definitely does helps when you play well, but as per my last and only other game, I once again walked off thinking, ‘This place is great’!!! After two days of calm, we awoke to a stiff morning breeze on Day 3. The breakfast banter was all about embracing the conditions and looking forward to the challenge….some were even ‘glad’ they would now get the ‘proper’ links experience. 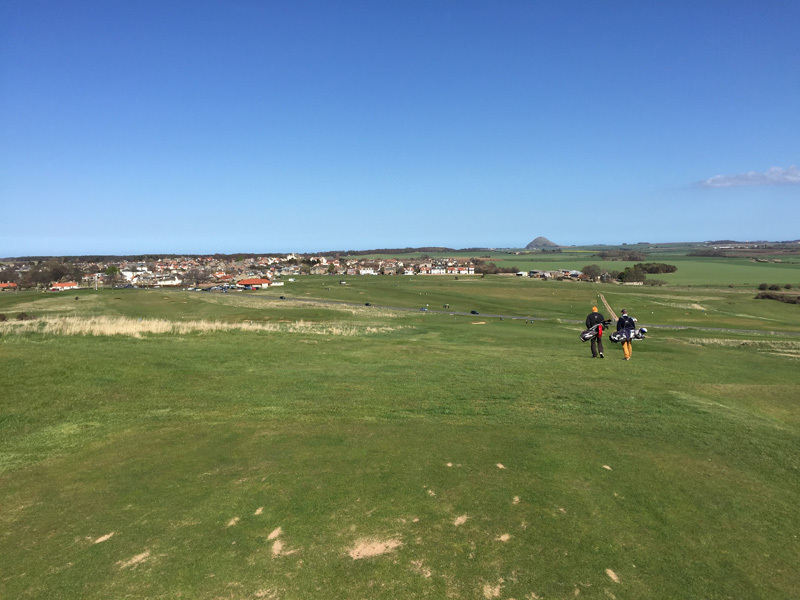 Needless to say, after just a few holes on the Jubilee, not many of us were as ‘embracing’, with one of the ‘links’ course novices exclaiming….’I just don’t get how people can love links golf? !’ (he wasn’t saying that after 38 points on day 1 though) Stableford scores plummeted and the high points from day 1 were now a distant memory. So, with golfing egos out the window and tails between respective legs, we headed off the ‘Jigger’ to drink away our golfing blues. As morning broke on the final day, the day / night before had clearly taken some casualties… (I being the worst hit – for which I was duly awarded the MVP prize!) 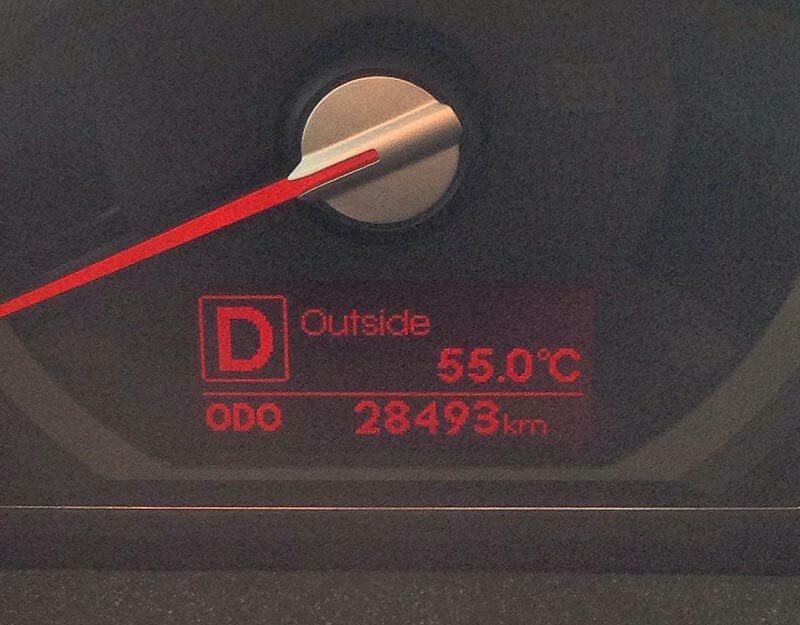 But this was ‘pay day’….a year’s worth of bragging rights – a year of being called ‘Champ’!! Our final examination was set for the New Course, with the same stiff breeze from day 3, further adding to the challenge. Scoring was once again difficult (i.e. poor) and coming down the final few holes we had a feeling that the scores were going to be close….and so it turned out! Over three rounds of stableford competition, first to last were covered by a mere 6 points….with the winner being a fine gentleman called Greg Betz. 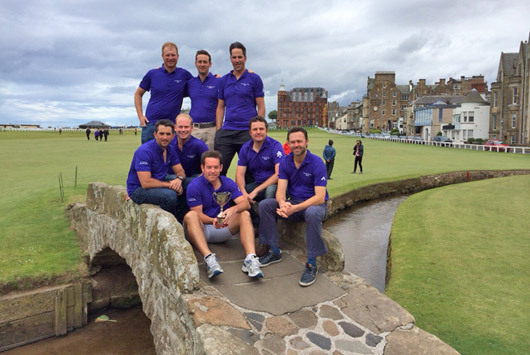 A truly memorable few days up in St Andrews was had by all – Great golf in a great place with good friends = Good times!